Unmanned surface vehicles (USVs) are gaining terrain in hydrographic surveying. They combine the advantages of small survey vessels with those of unmanned survey platforms, giving them a range of applications that is likely to expand even more. They enable hydrographic surveys in a greater number of areas, both inland and offshore. Due to the size of some USVs, they can access waters that are either too shallow for a regular survey vessel or difficult – even dangerous – to access to allow mobilisation of a manned survey vessel. This makes them the survey platform of choice for inshore and coastal areas like confined lakes, rivers, streams and quarry lakes. The surveyor just needs access to a relatively small area of surface water to launch and retrieve the USV. There’s a choice of these compact USVs which means that a team of two operators can manage them. The systems can be autonomous with pre-defined survey lines or remote controlled. As USVs for these purposes are relatively small and have a reduced draught (and height compared to the water surface), they can access the shallow borders of these waters with a bigger surveyed surface as a result. 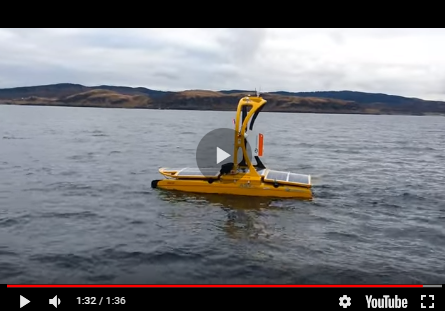 Examples of this kind of USV are the Teledyne Oceanscience Z-Boat, the CEE-USV, the SubseaTech CAT-Surveyor and the slightly bigger SeaRobotics 2.5 USV. On sea or oceans, USVs can either be used independently following their own track for longer science missions; or they can monitor a big area for oceanographic data, fisheries or security in their autonomous mode. In that case, solar panels or wind energy can add to the built-in propulsion source (either wave propelled or using an engine) to power the payload. AutoNaut, ASV C-Enduro and Liquid Robotics Wave Glider are examples of USVs suitable for these kinds of missions. They can access remote areas or work in harsh environments (high ocean states, bad weather) with no danger to the crew as they are not on the vessel. There’s also an example of a Wave Glider serving as a hub to observe air traffic in an area where the traditional land-based receivers don’t have coverage. Also offshore, but more specifically tasked to surveying for bathymetry, USVs are used to extend the capabilities of a survey vessel by survey in parallel to it, saving vessel time when surveying. Terrasond has used this method to survey the Bering Street for NOAA. They were able to create bathymetry to update nautical charts in considerably less time than it would have just using a survey vessel. They also can operate independently. The range of the on-board fuel may then be a limiting factor. The USVs are like the ones used for inland surveys but bigger to allow for added payload like multibeam echosounders and sidescan sonar for advanced mapping. Examples of these USVs are the C-Worker 5, Maritime Robotics USV Mariner, SeaRobotics USV 5.7, Oceanapha ME40 or Marine Tech RSV Orca 2. USVs find more and different uses and over the course of time, technology gets added to them. There are already examples of applications that take USVs further. The Marine Tech Sea Observer has the option to deploy a ROV facilitating monitoring offshore subsea structures. Ocean Infinity is conducting surveys using a survey vessel with several (currently up to six, three on each side) USVs that are linked to AUVs sailing below them. The AUVs send survey data to the USVs that transmit them to the vessel. Onboard the survey vessel, the survey data can be monitored in real time whilst the survey swath is wide (the more USV-AUV combinations are used, the wider the surveyed swath will be) making use of the depth capabilities of the AUVs. The ECA Group’s Inspector MK2 USV can be used as a docking station for AUVs and ROVs, including power and data downloads. The USV can also be used for faster transfer and offshore deployment of ROVs, AUVs and USVs. Looking further into the future, new developments could be endless as technology will enable new applications. It will be an interesting time!